Resuscitated almost-ran Teri Hatcher gets the gun and an action vehicle in this re-released 2001 TV movie. After the desperate housewife is fired from her job at Cy-Kor, a major arms dealer, her teenage son Michael (Trevor Blumas) kidnapped. In order to get him back alive, Jane must follow a bizarre set of instructions – including learning how to use a gun – that lead her to being framed for the murder of her boss. 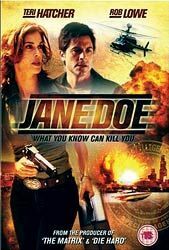 Writer-director Kevin Elders hits the ground running, immersing Jane in breakneck action from the get go, but the film’s white knuckle charms wear thin pretty quickly. Stars Hatcher and Rob Lowe (as Michael’s shady father) are both unconvincing. Ludicrous plot twists and enough cheesy one-liners to make Arnie cringe aside, there are a few decent action sequences here. Minimal extras.